Barbecues, BBQs, barbeques, barbies: it doesn't matter how you spell it – If you’re planning on hosting for friends and family this summer, buying the best barbecue can make all the difference to how successful the cooking results are. So, we've rounded up the very best barbecues, from traditional charcoal BBQs for grilling burgers and sausages to all-singing all-dancing gas BBQs perfect for cooking fish, portable barbecues for camping trips and festivals, smokers for serious, electric grills for when it rains and even barbecues for baking pizza. There's a barbecue to suit every chef, every event and every budget. If you're a BBQ beginner, find out how to barbecue right in our guide – it takes you through picking out the best barbecue for your specific needs, and tells you how to cook more than just burgers and dogs. For more ways to kit out your garden, head to our garden hub page. What is the best barbecue? Whether you’re cooking for friends or family, the BBQ can often take centre stage. To take the pressure off, making sure that you invest in one that both looks great and is fantastically functional is certainly the best way to go. We’ve found that the Weber Performer Deluxe Charcoal BBQ does a grand job of combining style with functionality, teaming up with an integrated cart to provide you with the ultimate cooking station. Alternatively, those of you who prefer to cook with gas may want to look at the Everdure by Heston Blumenthal Force 2 Burner Gas BBQ, which features two independently controlled gas burners and a high hood for convection cooking whole joints of meat. Which is your preferred barbeque fuel type, charcoal or gas? If you have a strong preference for that BBQ flavour, look at charcoal; if you have a bigger budget and prefer ease of use, gas is the way to go; if you've got a good budget and want bags of choice, pick a hybrid that offers you a choice of fuels and cooking styles. As a rough guide, for four people, you'll need a grill size that's less than 1800cm²; for six people, a grill up to 2500cm² will do; for eight people or more, look for a barbecue with a grill size that's 2500cm²+. If you’re looking for the king of all charcoal BBQs, this one from Weber is definitely one to consider. The BBQ itself is classically kettle-like, with a lid thermometer helping you to keep the temperature constant. To the side of the barbecue is a substantial prep area, which is great for placing baps and buns once the sausages and burgers are ready to serve. Thanks to the gas ignition, this Weber is ready to go in no time at all, while the GBS cooking grate provides you with plenty of scope when it comes to BBQ-ing your favourite ingredients. The best barbecue you can buy, we think. Find more of the best charcoal BBQs in our guide. For boutique gardens and small court yards, the stylish Green Egg BBQ is the best barbecue choice. Large enough for couples and small families, this medium sized barbecue features plenty of refined features that put it flights above other BBQs of the same size; from the patented air-flow technology that enables you to keep the BBQ at a constant heat to the intelligent insulation that ensures the outside of the Egg is never hot. There’s also the additional bonus of wooden shelves for prep area, while the temperature gauge ensures you’ll never under or over cook your food. You can’t really go wrong with a traditional kettle BBQ, the epitome of summer gatherings. This stylish one from Napoleon is lightweight yet sturdy, enabling you to transport it to the shed and back whenever it is required. The spacious lid provides you with plenty of space to barbeque whole joints of meat or alternatively, the grid is large enough to produce a BBQ feast, helped along by the temperature gauge, which should prevent you from burning or undercooking your food. The best kettle barbecue around, in our opinion. Whether one member of your family prefers gas and the other prefers coal or you’re really looking to maximise every available opportunity to cook outside this summer, this hybrid gas BBQ leaves you with plenty of scope for creating amazing food. When the barbecue is set up for gas cooking, there are three individual burners for you to closely control the temperature. Those who prefer to cook on charcoal will be pleased that the size of the BBQ enables you to slowly cook your food off the heat to prevent burning, while the warming rack will ensure the ingredients don’t go cold or spoil once cooked. The best barbecue for those who like to mix it up between cooking their food on gas or coal. Find more of the best gas BBQs in our guide. If you’re looking for a stylish, ergonomic BBQ that won’t cost you the earth, the Outback Omega 200 will definitely do the trick. The brand claim that its perfect for beginner BBQ masters, with its adjustable heat control helping you to cook your food without burning or undercooking it. Whether you’re looking to cook enough sausages to feed a small army or a deliciously smoked joint of meat for an alternative Sunday dinner, this barbecue provides you with enough space to do so. There’s plenty of prep area or you can use the wooden sideboards as serving stations for baps and buns. The best barbecue for beginners, we think! If you prefer the idea of cooking on gas but don’t want to lose out on the smokiness produced by charcoal BBQs, this best barbecue from Outback could be your answer. The gas flames heat the lava rocks which in turn collect the juices from the meat and turn it into flavoursome smoke, so you should still benefit from that distinct BBQ flavour. 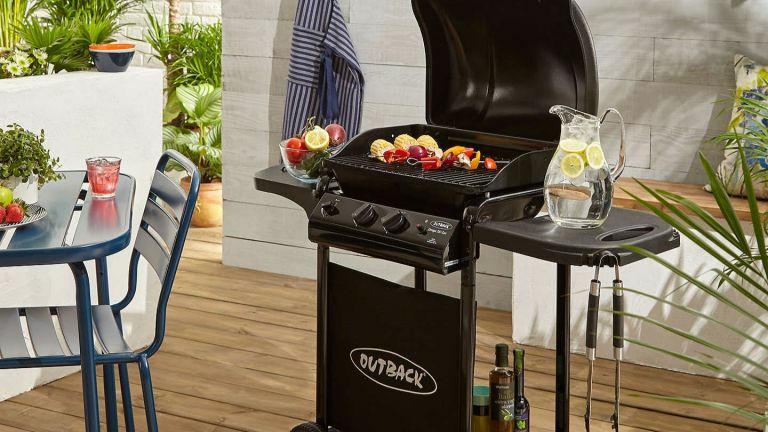 If you’re worried about having to spend large sums of money, it’ll be a comfort to learn that this barbeque should only set you back around £110, and with the added bonus of a prep table and a separate gas ring, it’s certainly great value for money. Great for cooking your food off the heat, this Premium 4 Burner BBQ enables you to keep two rings on and two off if you’re looking to slowly cook meat all the way through. The sideburner enables you to cook your side dishes separately to one side, while the other side can be your designated prep area. The BBQ features a handy heat rack to keep the food warm without burning it, while the temperature gauge helps you keep everything in check. The price tag is also extremely reasonable, making it our pick of the best barbecue for value. Small, yet perfectly formed, this BBQ designed by Apple’s former chief designer is great for compact garden spaces. With room to discreetly store a large gas canister underneath and a clever four wheeled base for portability, every detail has been thought about. When it comes to cooking, the barbecue boasts two cooking modes, including direct heat for fast grilling and searing and indirect heat for slow cooking. The heat reflection in the hood also helps with slow and low convection cooking, so no matter what you plan for dinner, you know it’s going to be cooked to perfection. The best barbecue for small gardens or those after something compact. Any cooking gadget with the name Heston Blumenthal attached to it is going to be great quality and well thought out and this BBQ is no different. It features two independently controlled gas burners for cooking on and off the heat with variable heat control so you can ensure that your ingredients are cooking at the perfect temperature. You can cook with the hood up or the hood down, with the hood being high enough for convection cooking if you fancy cooking a large joint of meat for everyone. Available in graphite, mint and red, there’s a BBQ to suit all tastes. We think this is the best barbecue for modern gardens. Large enough to cook effectively on charcoal, yet small enough to conveniently pack into the boot of the car, the Weber Smokey Joe is the best portable barbecue that also happens to be very friendly on the pocket. It features a steel cooking grate, a handy tuck and carry lid, a steel charcoal grate for aeration and a briquette measuring cup so you don’t over do it on the heat production. If you’re a fan of the traditional smokey flavour and need a BBQ large enough to feed a group of you, the Weber Smokey Joe is the perfect choice. See more of the best portable BBQs in our guide. If you like to be savvy with your money, this electric grill can double up as table top cooker and BBQ. Whether you’re taking on the cooking responsibilities at a summer BBQ or cooking a healthy mid-week dinner for the family, this trusty George Foreman should enable you to do it with ease. You can easily control the temperature of the electric grill so it provides the right amount heat for cooking different meats or fish. The outside temperature gauge will enable you to keep an eye on the temperature inside, too. See more of the best electrical grills in our guide. Weber’s the big name in barbecuing, so it’s no surprise that they’ve successfully turned their hand to barbecue smokers too. The appropriately named Smokey Mountain Cooker is, as you’d reasonably expect, on the pricier end of things. However, reviewers, award-winning competitive smokers among them, agree it’s the best of the best, loving its ample water pan and saying it’s quick to heat and holds an even temperature, the ideal combination for successfully slow-cooking tough cuts of meat. Multiple vents are a nice touch too, letting you compensate for the inevitable high winds of the British 'summer'. Our pick of the best smoker barbecue. See more of the best smokers in our guide. With naturally insulating clay and cork housing, a sturdy cast iron door and a durable stainless steel flue, this wood-fired pizza oven is exactly as rugged as it looks. Its superior heat retention means it’s great at cooking meats as well as pizza and bread, making it a versatile addition to the outdoor diner that can roast, smoke and grill as well as bake. Buyers at the helm of busy family households are sure to love that, unlike most metal options, the outside of the oven stays cool during use, too. Find more of the best outdoor pizza ovens in our guide.